For other uses, see Hamlet (disambiguation). A hamlet is a small human settlement. In different jurisdictions and geographies, hamlets may be the size of a town, village or parish, be considered a smaller settlement or subdivision or satellite entity to a larger settlement. The word and concept of a hamlet have roots in the Anglo-Norman settlement of England, where the old French hamlet came to apply to small human settlements. In British geography, a hamlet is considered smaller than a village and distinctly without a church (one road with houses either side). The word comes from Anglo-Norman hamelet, corresponding to Old French hamelet, the diminutive of Old French hamel. This, in turn, is a diminutive of Old French ham, possibly borrowed from (West Germanic) Franconian languages. Compare with modern French hameau, Dutch heem, German Heim, Old English hām and Modern English home. In Afghanistan the counterpart of the hamlet is the qala (Dari: قلعه, Pashto: کلي) meaning "fort" or "hamlet". The Afghan qala is a fortified group of houses, generally with its own community building such as a mosque, but without its own marketplace. The qala is the smallest type of settlement in Afghan society, trumped by the village (Dari/Pashto: ده), which is larger and includes a commercial area. In Australia a hamlet is a small village. Officially, a hamlet differs from a village in having no commercial premises, but has residences and may have community buildings such as churches and public halls. Yukon had two hamlets, both of which had a population of less than 450 people as of the 2016 census. In Canada's provinces, hamlets are usually small unincorporated communities within a larger municipality (similar to civil townships in the United States), such as many communities within the single-tier municipalities of Ontario or within Alberta's specialized and rural municipalities. Canada's two largest hamlets—Fort McMurray (formerly incorporated as a city) and Sherwood Park—are located in Alberta. They each have populations, within their main urban area, in excess of 60,000—well in excess of the 10,000-person threshold that can choose to incorporate as a city in Alberta. As such, these two hamlets have been further designated by the Province of Alberta as urban service areas. An urban service area is recognized as equivalent to a city for the purposes of provincial and federal program delivery and grant eligibility. During the 18th century, for rich or noble people, it was up-to-date to create their own hameau (hamlet) in their gardens. They were a group of some houses or farms with rustic appearance, but in fact were very comfortable. The best known is the Hameau de la Reine built by the queen Marie-Antoinette in the park of the Château de Versailles. Or the Hameau de Chantilly built by Louis Joseph, Prince of Condé in Chantilly, Oise. Lieu-dit (local name) is another name for hamlet. The difference is that a hamlet is permanently inhabited, but a lieu-dit is not (in winter for example, or when the lieu-dit is only an important road crossing). The German word for hamlet is Weiler (German: [ˈva͡ɪlɐ]). A Weiler has, compared to a Dorf (village), no infrastructure (i.e. no church, no inn, no school, no store). The houses and farms of a Weiler can be grouped (in the hills and the mountains) or scattered (in the plains). In North West Germany, a group of scattered farms is called Bauernschaft. In a Weiler there are no street names, the houses are just numbered. In different states of India, there are different words for hamlet. In Haryana and Rajasthan it is called "dhani" (Hindi: ढाणी ḍhāṇī) or "Thok". In Gujarat a hamlet is called a "nesada", which are more prevalent in the Gir forest. In Maharashtra it's called a "pada". In southern Bihar, especially in the Magadh division, a hamlet is called a "bigha". All over Indonesia, hamlets are translated as "small village", or kampung. They are known as dusun in Central Java and East Java, banjar in Bali, jorong or kampuang in West Sumatra. In Pakistan a hamlet is called a gron (pronounced as grona with some nasalisation at the end). 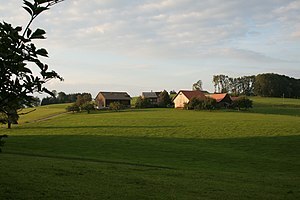 In Poland a hamlet is called osada, and is legally a small rural settlement, especially differing by type of buildings or inhabited by population connected with some place or workplace (like mill hamlet, forest hamlet, fishermen hamlet, railway hamlet, State Agricultural Farm hamlet). It can be independent settlement, or a part of other settlement, like village. In Romania hamlets are called cătunuri (singular: cătun), and they represent villages that contain several houses at most. They are legally considered villages, and statistically, they are placed in the same category. Like villages, they do not have a separate administration, and thus are not an administrative division, but are part of a parent commune. In the Russian language there are several words which mean "a hamlet", but all of them are approximately equal. The most common word is деревня (derevnia, the word meant "an arable" in the past); the words село (selo, from the Russian word селиться (selit'tsa), meaning "to settle") and посёлок (posiolok) are quite frequently used, too. A hamlet in Russia usually has a church, some little shops, a school and a local culture center (дом культуры / dom kultury, literally meaning "a house of culture"), in which different culture events and national holidays take place. A hamlet in Russia consists of several tens of wooden (sometimes brick) houses. In the past hamlets were the most common kind of settlement in Russia, but nowadays many hamlets in Russia are settled only during the summer as places for vacation because people go to towns and cities in order to find better jobs and get a better education than a rural school can offer. In the four national languages hamlets are known as Weiler (German), hameaux (French), frazioni (Italian) and fracziun (Romansh). A hamlet is always part of a larger municipality or may be shared between two municipalities. The difference between a hamlet and a village is that typically a hamlet lacks a compact core settlement and lacks a central building such as a church or inn. However, some hamlets (Kirchwiler) may have grown up as an unplanned settlement around a church. There is no population limit that defines a hamlet and some hamlets have a larger population than some of the smallest municipalities. Generally there are no street names in a hamlet; rather, addresses are given by hamlet name and a number. House numbers might start at one side of the hamlet and continue to the other side or may have no clear organization. A hamlet may form or have formed a Bürgergemeinde (legal place of citizenship regardless of where a person was born or currently lives) and may own common property for the Bürgergemeinde. In Ukraine, a very small village such as a hamlet usually is called a khutir. In the United Kingdom, the word hamlet (having the French origin given at the top of this article), means a house or village without a church, although hamlets are recognised as part of land use planning policies and administration. In modern usage it generally refers to a secondary settlement in a civil parish, after the main settlement (if any). Hamlets may have been formed around a single source of economic activity such as a farm, mill, mine or harbour that employed its working population. 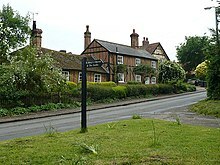 Some hamlets, particularly those that have a medieval church, may be the result of the depopulation of a village; an example of such a hamlet is Graby. Because of the hilly topography of the parish, the village of Clent, situated on the Clent Hills consists of five distinct hamlets. The term hamlet was used in some parts of the country, notably Wales, to denote a geographical subdivision of a parish (which might or might not contain a settlement). Elsewhere, these subdivisions were called "townships" or "tithings". In the Scottish Highlands the term clachan, of Gaelic derivation, may be preferred to the term hamlet. Also found in Scotland more generally is fermtoun used in the specific case of a settlement of agricultural workers' homes. In Northern Ireland the common Irish place name element baile is sometimes considered equivalent to the term hamlet in English, although baile would actually have referred to what is known in English today as a townland: that is to say, a geographical locality rather than a small village. In Mississippi, a 2009 state law (§ 17-27-5) set aside the term "municipal historical hamlet" to designate any former city, town or village with a current population of less than six hundred (600) inhabitants that lost its charter before 1945. The first such designation was applied to Bogue Chitto, Lincoln County. In New York, hamlets are unincorporated settlements within towns. Hamlets are usually not legal entities and have no local government or official boundaries. Their approximate locations will often be noted on road signs, however. A hamlet usually depends upon the town that contains it for municipal services and government; the town can define a "special use district" (a type of local entity designed to provide a specific service, such as water, sewer, or lighting) to provide only that hamlet with services. A hamlet could be described as the rural or suburban equivalent of a neighborhood in a city or village. The area of a hamlet may not be exactly defined; it may be designated by the Census Bureau, or it may rely on some other form of border (such as a ZIP Code, school district or fire district for more urbanized areas; rural hamlets are typically only demarcated by speed zones on the roads serving them). Others, such as Forestville, New York, will be the remnants of former villages, with borders coextant with the previously defined borders of the defunct or dissolved village. Some hamlets proximate to urban areas are sometimes continuous with their cities and appear to be neighborhoods, but they still are under the jurisdiction of the town. Some localities designated as hamlets, such as Levittown in the Town of Hempstead, with a population of over 50,000, are more populous than some incorporated cities in the state. In Oregon, specifically in Clackamas County, a hamlet is a form of local government for small communities, which allows the citizens therein to organize and co-ordinate community activities. Hamlets do not provide services such as utilities or fire protection, and do not have the authority to levy taxes or fees. There are four hamlets in Oregon: Beavercreek, Mulino, Molalla Prairie, and Stafford. In Vietnam, a hamlet (xóm, ấp) is the smallest unofficial administrative unit. It is a subdivision of a commune or township (xã). ^ T. F. Hoad, English Etymology, Oxford University Press, 1993, ISBN 0-19-283098-8. ^ "A dictionary of the Puk'hto, Pus'hto, or language of the Afghans". dsalsrv02.uchicago.edu. Retrieved 2018-05-04. ^ a b c d Statistics Canada (2010). "Interim List of Changes to Municipal Boundaries, Status, and Names (From January 2, 2009 to January 1, 2010)" (PDF). Retrieved 2010-11-17. ^ "Population and dwelling counts, for Canada, provinces and territories, and census subdivisions (municipalities), 2016 and 2011 censuses – 100% data (Northwest Territories)". Statistics Canada. February 8, 2017. Retrieved April 19, 2018. ^ "Population and dwelling counts, for Canada, provinces and territories, and census subdivisions (municipalities), 2016 and 2011 censuses – 100% data (Nunavut)". Statistics Canada. February 8, 2017. Retrieved April 19, 2018. ^ Statistics Canada (2018-02-08). "Population and dwelling counts, for Canada, provinces and territories, and census subdivisions (municipalities), 2006 and 2001 censuses – 100% data (Yukon Territory)". Retrieved 2018-04-18. ^ Alberta Municipal Affairs (2010-04-01). "Specialized and Rural Municipalities and Their Communities" (PDF). Retrieved 2010-11-17. ^ Alberta Municipal Affairs (2010-11-15). "Municipal Profile – Regional Municipality of Wood Buffalo". Retrieved 2010-11-17. ^ Alberta Municipal Affairs (2009-09-15). "2009 Official Population List" (PDF). Retrieved 2010-11-17. ^ Alberta Queen's Printer (2009-09-15). "2009 Official Population List". Retrieved 2010-11-17. ^ Alberta Municipal Affairs (2010-04-01). "2010 Municipal Codes" (PDF). Retrieved 2010-11-17. ^ Province of Alberta (1994-12-21). "Order in Council 817/94 (R.M. of Wood Buffalo status change to specialized municipality)" (PDF). Retrieved 2010-11-17. ^ Province of Alberta (1995-12-06). "Order in Council 761/95 (Strathcona County status change to specialized municipality)" (PDF). Retrieved 2010-11-17. ^ Ashutosh Goyal, 2015, "RBS Visitors Guide India - Rajasthan: Rajasthan Travel guide"., Data & Expo India Pvt Ltd, ISBN 9380844786. ^ Rann Singh Mann, K. Mann, 1989, "Tribal Cultures and Change"., pp. 23. ^ S. H. M. Rizvi, 1987 "Mina, the ruling tribe of Rajasthan: socio-biological appraisal"., pp. 34. ^ Projektteam SINUS. Landschaftsökologische Strukturmerkmale als Indikatoren der Nachhaltigkeit, Spatial INdices for LandUSe Sustainability (SINUS) (PDF) (Report). University of Vienna. pp. 308–317. Archived from the original (PDF) on 14 December 2013. Retrieved 16 May 2013. ^ Hardy-Ivamy, E.R. (1993). Mozley & Whiteley's law dictionary. London: Butterworths. p. 124. ISBN 978-0-406-01420-7. ^ "Status definition: Hamlet". A Vision of Britain through Time. Great Britain Historical GIS Project. Retrieved 2007-08-31. ^ "Clachan". Dictionary of the Scots Language. Archived from the original on 4 April 2012. Retrieved 2011-10-24.